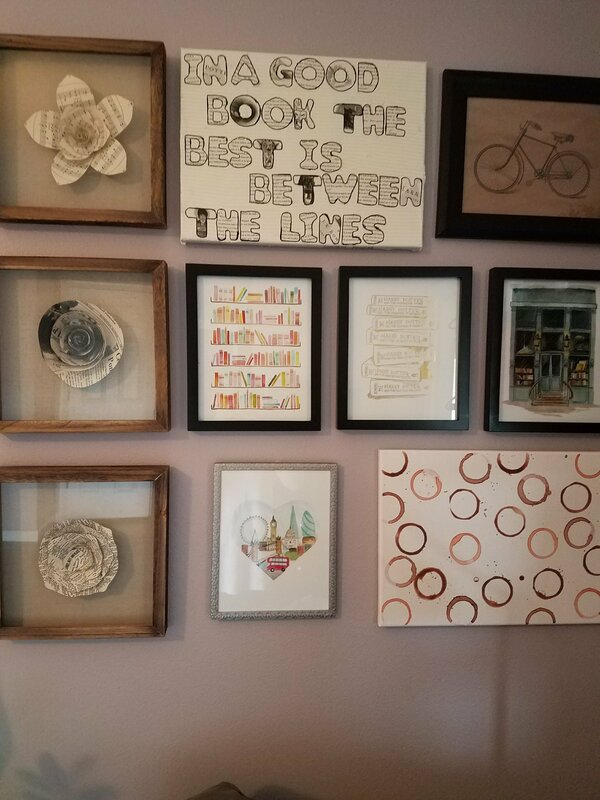 I couldn’t wait to share with you all the construction and finished product of my bedroom reading nook! Nothing is better than a cozy spot and a strong cup of tea or coffee. This was truly a dream come true and it is by far my most favorite spot in the house… though possibly tied with my espresso machine and tea kettle 😆. Do you have a reading nook? Where is your favorite spot to read? I would love to do it in the bedroom, but then I would have to move the dog’s beds, hahaha. Technically, the toys are my 6 yr old daughters, which I can mostly live with since it’s a table and art stuff although when she cuts paper everywhere I want to scream, but my oldest son has completely taken over one corner with a desk, laptop, and PlayStation (and a bunch of stuff I have no idea what it is), so he doesn’t have to share his gaming things with his brother! Urgh!! I feel like that should be my corner, lol! It’s perfect for a nice recliner or chair, a bookshelf, comfy cushions, etc. Claim it! (Easier said than done 🙃) I definitely feel more at peace with my crazy life knowing I have my little private corner to retreat to. Yeah that’s tough! Parenthood is just full of sacrifices 😫 your time will come! I’m in the throes of the three-nager stage now so my nook is my coping mechanism. Yes, it is! It’s bittersweet the older they get and you know they will be leaving you and starting a new life, so those sacrifices are worth it and different somehow. Hahaha! I know the three-nager stage well! My six year old daughter has been in the -nager stage since she was around that age too! I’m hoping she gets out of it by the time she is an actual teenager. Reading is my way of coping with leaving with 2 teenagers and a 6 yr old, oh, and an often grumpy husband, lol! And I teach college kids, so I have to escape from them too! Yikes! Yeah my kiddo just turned 3 so this week was an emotional one realizing how quickly time goes by! Reading is definitely my escape too- I work night shift at a hospital so it’s a good way to de-stress! Oh my gosh, I love it. It looks so cozy! Thanks 😊 it is! The chair is huge so I can curl up or stretch out- exercise all of my reading positions! Oh, those kind of chairs are the best! I hope you do! This nook was a byproduct of a move as well. Gorgeous!!!! 😍 I want one too! Do it! It’s so lovely to have a place dedicated to reading that I can just escape to when I need. I absolutely love those shelves (especially the plants!). So cosy! I made myself a book nook awhile back. Unfortunately, it is also a closet still and hard to get in and out of. But, I almost always turn to a footstool in a corner of my kitchen. I do a TON of cooking and baking and whatnot and in between the minutes, I read. Inevitably, I devour a great many books from that spot near the window in my kitchen! It’s been a long time coming but I’m so thankful we finally did it! 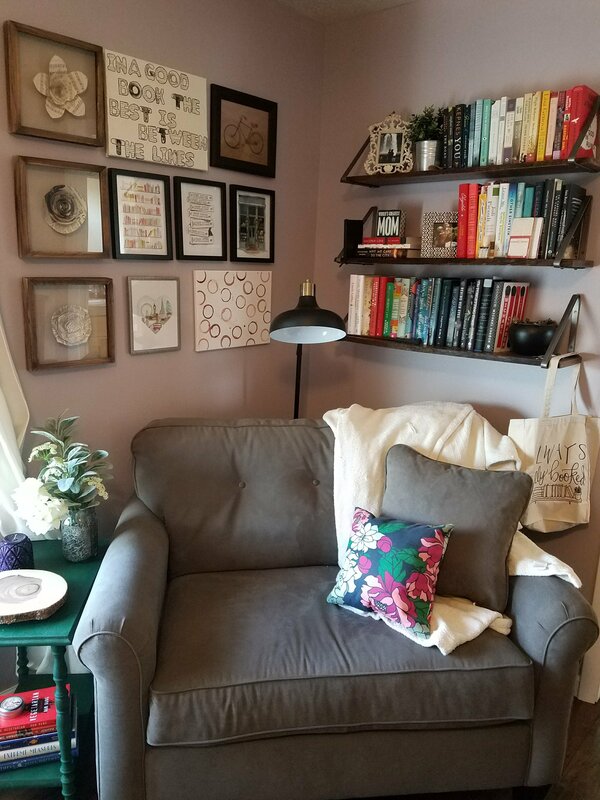 I’m very jealous of your reading nook, it looks stunning and that chair so cosy beneath the bookish prints. Oh my! That is amazing! I love it! Great work! Thanks! It’s technically a chair and a half so it’s perfect for sitting on a stretching out a bit if needed. This nook is AMAZING!! I’m in the process of creating one myself since we just moved into a house (from a tiny apartment). This serves as great inspiration for the decor part, and looks like a great post idea once it’s complete 🙂 I know you’ll enjoy many books in that comfy-looking chair! Definitely share your finished product! The artwork is a combination of crafting and Etsy. It was a fun post to do!